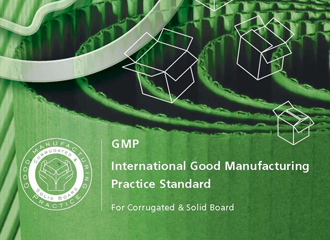 GMP is a standard which covers the manufacturing of packaging made of corrugated and solid board in order to fulfill legal reqiurements according to EU regulations 1935/2004/EG for food contact materials. The food safety act says that in the development, manufacture, distribution, advertising or sale of food products to the consumer all reasonable precautions have to be taken. Therefore all the actors of the supply chain (be it the producers, the packers or the suppliers) are responsible for ensuring the quality, safety, and hygiene not only of food, but also of packaging. The corrugated industry produces the N°1 transport packaging in the world, and translated that responsibility into an International Good Manufacturing Practice Standard, launched by FEFCO/ESBO at the end of 2003, to ensure that boxes meet all the requirements of quality, safety and hygiene. Furthermore such a transparent standard, adapted to the material, also respects all its specific qualities (versatility, lightness, strength, recyclability). GMP means having a total control system in place in each manufacturing plant. The purpose is to ensure that from the purchase of raw material to the delivery of the finished product to the customers' premises, all parameters of quality, hygiene and traceability are monitored. it meets the requirements of EU regulation 1935/2004/EG concerning the GMP implementation during the manufacturing of packaging intended for food from corrugated and/or solid board.